Congressman Jim Bridenstine invites you to attend a Securing America Town Hall on Tuesday evening April 11th, 6:30-8:00 PM, at the Mabee Center in Tulsa. Congressman Bridenstine will be taking questions from constituents and discussing recent events in Washington D.C. Doors open at 6:00 PM. No tickets required. Congressman Jim Bridenstine was a guest at the signing ceremony in the White House as President Trump signed into law S. 442, the National Aeronautics and Space Administration Transition Authorization Act of 2017. The vote on the American Healthcare Act is a very tough decision. As the Representative of the First District of Oklahoma, my philosophy has been to fight for the most conservative option possible, and I often vote “No” to get to a “better Yes”. The NASA Authorization Bill has gone to the President’s desk after passing unanimously in both the Senate and the House. Several provisions from Congressman Bridenstine’s American Space Renaissance Act were included in the Authorization. On February 16th, Congressman Jim Bridenstine voted to block an Obama Administration regulation which opened a backdoor to funding abortion with taxpayer funds. Congressman Bridenstine recently voted to promote Oklahoma’s energy industry by supporting H.J.Res. 36, legislation to block the Bureau of Land Management’s (BLM) overreaching and duplicative methane emissions rule. The bill passed the House 221-191. This past month brought the world another banned missile launch from North Korea followed by another emergency UN Security Council meeting. Another round of diplomatic tough talk and sanctions is surely on the way. The theme for the 2017 Congressional Art Competition is “Route 66: Exploring the Mother Road”. The competition is open to all high school students in the 1st District of Oklahoma. Congressman Bridenstine will be hosting a Service Academy Day on April 22, 2017 from 9 a.m. to 12 p.m. in the 1st floor auditorium of the CityPlex Towers. The purpose of this event is to provide students who are interested in attending a service academy a forum to gather information and ask any questions they may have. 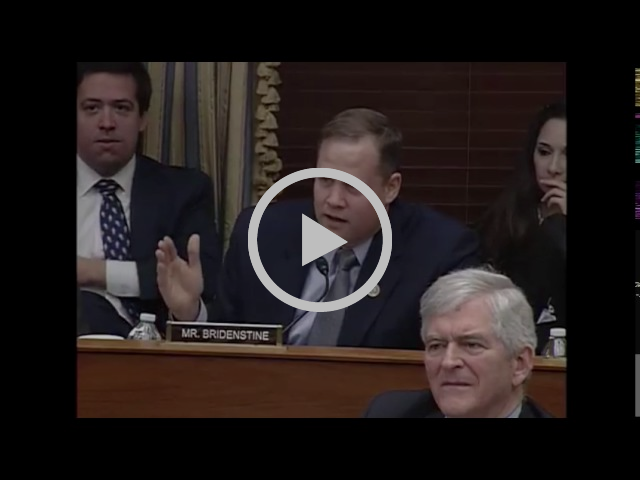 Copyright © 2017 Congressman Jim Bridenstine, All rights reserved.